Historical world political boundaries from 1946-2008 are from the CShapes dataset; see note below regarding pre-1946 boundaries. 1. Type a PRESENT-day Place and a HISTORICAL Year as early as 2000 BC, then hit the "Go!" button. The place you type must be a PRESENT-day city and country; or a present-day address or road name* with city and country. The year must be from 2000 BC through 2008 AD (use negative years for BC, such as -200 for 200 BC). 2. Once you see country boundaries, click inside any country to see its name and details. The information window that appears lists the country name and the timeframe the boundaries were in effect; additionally, for the years 1946 through 2008, the capital is also shown. Click the < and > buttons next to the Year input box to go back and forward a decade at a time. 3. Share this tool using the social sharing buttons at left. Subscribe to this blog at right in order to receive notification of updates and enhancements. - The information for all years prior to 1946 includes very generalized boundaries, very rough timeframes for the boundaries, and includes some errors and omissions. As such, the information for that timeframe should be used as a very rough guide only. * The Place box uses a standard Google Maps geocoding engine, therefore you can type a present-day street address, a road name, a point of interest, and the like, and then type in the correct historical year to see what country that address or road was located in back then. Of course, this doesn't account for addresses or road names that may have changed, so if you suspect that, then just start with the present-day city and country name. - This tool uses an experimental Google Maps API feature called Fusion Table Layers. As with any new and innovative technology, don't be surprised if things occasionally don't function as expected. - The source of the historical world political boundaries and related information for the years 1946-2008 used in this tool is The Geography of the International System: The CShapes Dataset by Nils B. Weidmann, Doreen Kuse and Kristian Skrede Gleditsch, 2010. - The original source of the information for all years prior to 1946 is unknown; it includes very generalized boundaries, very rough timeframes for the boundaries, and includes some errors and omissions. As such, the information for that timeframe should be used as a very rough guide only. Looking for U.S. historical county boundaries? Try the Historical County Boundary Maps tool on this website to put your search in the correct historical geographic context. It uses Google Maps to display U.S. County Boundaries from ANY HISTORICAL YEAR. You can then click any county on the map to see the specific history of the boundary changes, and type in different years to see the boundary changes over time. 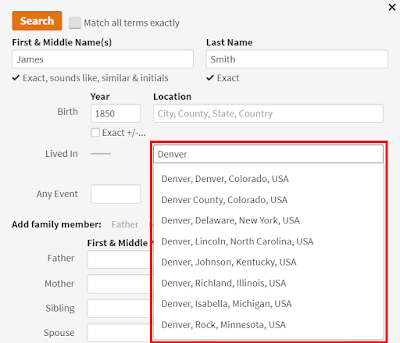 Also, check out the AncestorSearch using Google Custom Search tool on this website to build a Google search that is optimized to find web pages mentioning your ancestors! The search returns a more focused set of results by using advanced Google search techniques including exact phrases, forward and reverse name order, alternate name spellings, logical operators, and so on. For live people, try using the PeopleSearch using Google Custom Search tool.